NUJ rally against Trinity Mirror’s Caernarfon office shutdown | News by Wales Express News, People Before Profit! The National Union of Journalists (NUJ) held a rally yesterday against Trinity Mirror’s plans to shut down their Caernarfon office. 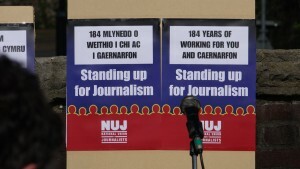 The National Union of Journalists (NUJ) held a rally today against Trinity Mirror’s plans to shut down their Caernarfon office. 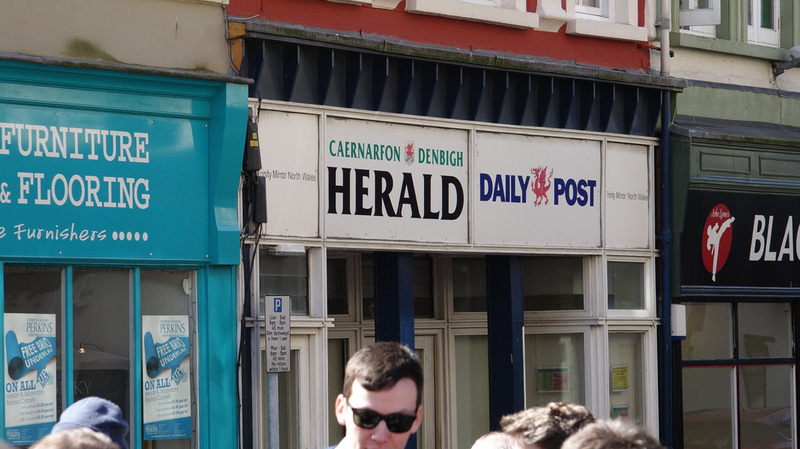 The Caernarfon Herald has had a presence in the town since its establishment in 1831, and about a 100 people attended the rally today to show their concern at the plans for closure. Speaking at the event were Plaid Cymru’s Parliamentary candidate for Arfon, Hywel Williams MP, Labour’s Parliamentary candidate for Arfon, Alun Pugh, Gwynedd Council Leader Dyfed Edwards, Bethel councillor Sion Jones, one of the rally organisers and Chair of the North Wales branch of the NUJ, Paul Scott, and Adam Christy, joint president of the NUJ. The NUJ said: “We believe the closure of the Caernarfon office could undermine the future viability of our local newspapers and lead to the closure of the historic publications. However, Trinity Mirror have said that the decision to close the office at Eastgate Street, Caernarfon, would have “no impact” on editorial staff or its local newspaper titles such as the Holyhead Mail, Bangor Mail and Caernarfon Herald. A Trinity Mirror spokesperson said: “We remain firmly committed to regional media and our titles in this area are very important parts of our portfolio. Paul Scott said: “”People came out today to demonstrate how important their local newspapers are to them. Trinity Mirror has repeatedly given assurances concerning the future security of these titles, but we fear that backwards steps such as these put the future sustainability of these publications at serious risk. The NUJ have set up an online petition for those who are against the plan to close the Herald and Daily Post office, it can be seen at https://www.change.org/p/trinity-mirror-plc-caernarfon-and-denbigh-herald-daily-post-office closure.